This Hot Pot is my idea of the perfect detox dinner. 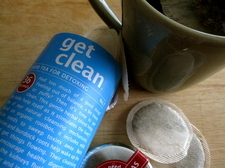 I almost renamed it "Get Clean Soup" because it reminds me of a new favorite tea ("Get Clean", from The Republic of Tea), which I recently purchased at Whole Foods. The tea caught my eye because the description on the label begins: "Had too much of a good thing? Feeling out of balance, a bit heavy or puffy?" Yes, after the holidays, that would be me. I'll sip this tea in the coming weeks in hopes of a speedy recovery. I will also brew pots of Hot Pot, a favorite cleansing soup I make routinely in the months of January, February and March. Kimchi, which is a fermented, unctuous, spicy cabbage, lends a great deal of flavor to the brew. Fresh sliced cabbage could be substituted, if desired. 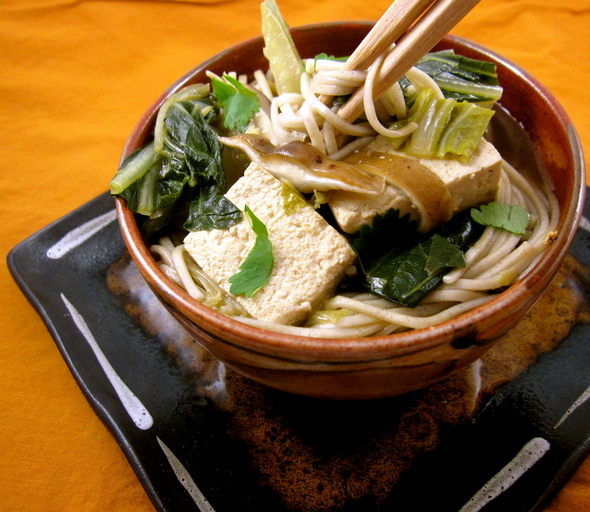 Hot Pot with Chicken and Soba Noodles is another favorite, which will also cure what ails me. *Select hot or mild kimchi, according to your palate. I usually select mild kimchi and let individuals add chili paste or red pepper flakes according to individual taste. 1. In a large pot or wok, heat 1 tablespoon oil over medium heat. Add shallot and ginger and cook 3-4 minutes or until just tender and fragrant. 2. Put the stock, 2 tablespoons soy sauce, 1 cup kimchi and bok choy stem ends into the pot, and bring to a boil. Reduce heat and allow the broth to simmer for 10 minutes or until bok choy stems are just tender. Add mushrooms, boy choy greens, and tofu and additional soy sauce and kimchi to taste, if desired, and simmer an additional 5-10 minutes or until mushroom are tender. Stir in chopped cilantro, if using. 3. Meanwhile, while soup is simmering, bring a pot of salted water to a boil and cook soba noodles according to package instructions. 4. Add the noodles to the soup before serving; or divide the noodles between six bowls, pour steaming soup over noodles and serve. Tue, Jan 10, 2012 : 10:54 p.m.
Tue, Jan 10, 2012 : 7:34 p.m. I have a great deal to learn about this topic! Thanks for piquing my interest. I know the Coop always has such a great selection of bulk, just about everything; it turns over quickly so it's always fresh, too. I'm delighted to learn about Arbor Teas; I've never been there but will absolutely make it a point to purchase some teas, er, tissanes there! I'm going to poach some chicken or fish in a double-strength batch of that Bangkok green I referred to. Tue, Jan 10, 2012 : 4:15 p.m.
Tue, Jan 10, 2012 : 9:01 p.m.
Arbor Tea Company has the best Rooibos tea I've ever had. And their to-the-door delivery is fabulous. I agree! Tue, Jan 10, 2012 : 7:02 p.m.
&quot;Herbal teas, which are really tissanes, also have a short steep time but they don't have therapeutic value.&quot; Linda, this is not my area of expertise, but I am aware of at least one study that showed hibiscus tea/tisane to have a significant effect on lowering systolic blood pressure with the effect more pronounced in those with higher pressures ( <a href="http://jn.nutrition.org/content/140/2/298.short" rel='nofollow'>http://jn.nutrition.org/content/140/2/298.short</a> ). Another local source for teas (black, oolong, green white, pu-erh, and herbal) is Arbor Teas ( <a href="http://www.arborteas.com/" rel='nofollow'>www.arborteas.com/</a> ). All of their products are organic and many are fair-trade certified. Other business practices of theirs also are laudatory and it would be worthwhile visiting their website. They offer free delivery within Ann Arbor on Fridays. Other than being a satisfied customer of theirs for several years, I have no other connection with them. Unfortunately, though, currently they do not offer any hibiscus tea/tisane that I can see. Tue, Jan 10, 2012 : 5:49 p.m.
Well here is where the word tea gets people in trouble. I wrote a whole blog about this for AnnArbor.com <a href="http://www.annarbor.com/entertainment/food-drink/wildcrafting-there-is-no-such-thing-as-herbal-tea/">http://www.annarbor.com/entertainment/food-drink/wildcrafting-there-is-no-such-thing-as-herbal-tea/</a> Technically, only a beverage containing the plant Camellia sinensis is a true tea. And the steep time should be just a few minutes. Herbal teas, which are really tissanes, also have a short steep time but they don't have therapeutic value. Herbal plants that have volatile oils (think mint) you would also steep for a short time - about 20 minutes is long enough to extract the oil. Longer would be unpleasant for most people. For roots and seeds, many hours are needed, for leaves that do not contain a lot of volatile oils, a number of hours would also be advised if you want a therapeutic effect. So white and green teas are true teas, different harvest and preparations times of the Camellia sinensis plant (not my area of expertise - I don't know exactly what makes them different) but they have antioxidants that are beneficial and those are extracted quickly. So the Bangkok Green Tea with ginger would have some value, and I'm sure great taste, but the ginger wouldn't have time to reach a therapeutic dose in 3 minutes. But the some of the oils would be in the drink, enough to give a mild ginger flavor. Hope that helps. Crazy Wisdom does carry some of the herbal tissanes, and how long you steep them is up to you. But I'd recommend the excellent bulk herb section of the People's Food Co-op, and try stinging nettle, red clover, oatstraw, or red raspberry for a start. Nourishing herbs that can be steeped overnight. We call those infusions. Use about an ounce per quart of hot (just off the boil) water. I also have free classes that describe more about this - a commonly misunderstood part of herbology. Tue, Jan 10, 2012 : 1:27 p.m.
Hi Peggy. I'm sorry to have to point out that the tea in question would have little actual impact if you made it according to the directions (steep 5-7 minutes). That just isn't much time for the helpful nutrients and alkaloids to be extracted from the ingredients. Especially when they are roots. That is time for the tannins to be released though. The tea you mention does contain some great ingredients, (Organic Rooibos (leaf), Milk Thistle (seed), Indian Sarsaparilla (root), Dandelion (root), Chicory (root), Burdock (root), Red Clover (herb). Other Ingredients: Natural Vanilla Flavor, Natural Almond Flavor - information taken from their web site <a href="http://bit.ly/yg1Ig5)" rel='nofollow'>http://bit.ly/yg1Ig5)</a> that are very nourishing when infused, but that would take at least 20 minutes and most herbalists would suggest 3 hours or more, even overnight. I'm not sure what happens to those flavorings with such a long steeping process, though. If you really want to use those plants for therapeutic reasons, I'd suggest one at a time and using a process that would provide an actual therapeutic dose. But of course, that's also when potential side effects and interactions are more possible. Two ways to make this soup more nourishing would be to add a spoonful of miso paste to each bowl after it has cooked, (you can also then use plain water as the stock) and to use the kim chi also at the end, without cooking it, so that its natural fermented value can be utilized by the body. My approach is to think of nourishment rather than cleansing - the body is pretty brilliant at doing &quot;cleansing&quot; and re-balancing when we're well nourished. It happens to be the topic of a free workshop I'm giving Thursday January 26th at Crazy Wisdom Bookstore, sponsored by the People's Food Co-op, the title is &quot;The Myth of Fasting: Using Herbs for Nourishment, Not Punishment&quot;. You can register for free at the Co-op or just drop in. Thanks so much for all your great recipes!